Either concrete or paving slabs can be used in each of the four corners. 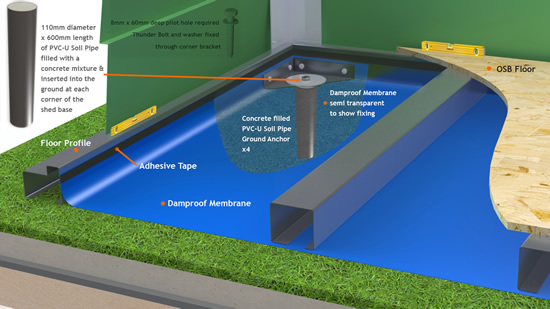 With this method you must place a thick polythene sheet on top of the grass and attach to the metal base with heavy duty weatherproof tape (see illustration). This will help prevent moisture rising inside and possibly causing condensation. We would also recommend using our optional wooden floor kit, as the polythene sheet membrane will become damaged when walked upon. 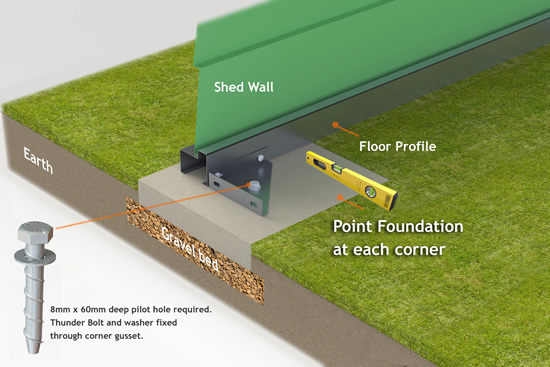 The “Thunderbolt” fasteners (supplied) are ideal for bolting the shed down onto concrete or slabs, as the holes required (drilled down through the corner gusset into the concrete or slabs) can be made after the shed is in position. It is important that the base area MUST be flat and level. A PVC-U soil pipe filled with concrete dug into the ground in the four corners can be used. 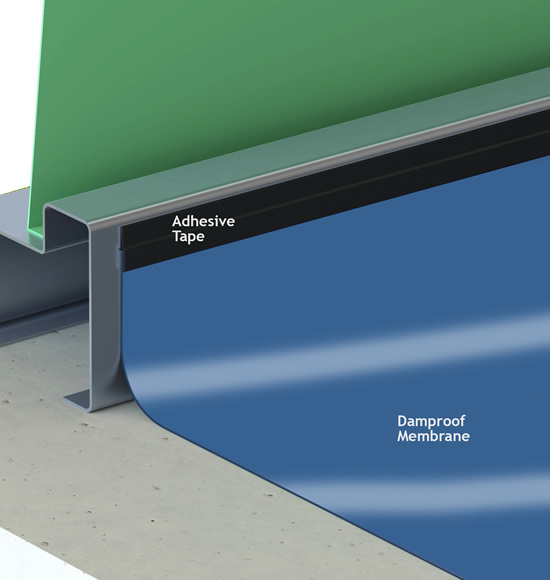 With this method you must place a thick polythene sheet on top of the grass and attach to the metal base with heavy duty weatherproof tape (see illustration). This will help prevent moisture rising inside and possibly causing condensation. We would also recommend using our optional wooden floor kit, as the polythene sheet membrane will become damaged when walked upon. The “Thunderbolt” fasteners (supplied) are ideal for bolting the shed down onto concrete or slabs, as the holes required (drilled down through the corner gusset into the concrete or slabs) can be made after the shed is in position. It is important that the base area MUST be flat and level.